Online gaming? “IRL”? What’s real life anyway? What’s the virtual world? Is it really possible to be literally addicted to technology? Questions like these are much discussed these days, and they are addressed in the Weston High School Theater Company’s excellent ensemble-written one-act play, Player by Proxy. Unlike the proverbial camel designed by a committee, this seamless production actually managed to survive being written by a huge ensemble of 31 students! All the actors, crew, stage managers, etc., collaborated in every aspect of the show, from beginning to end. As such, I’m not going to single out any individual student’s efforts, but I do need to comment on the gestalt of the play. 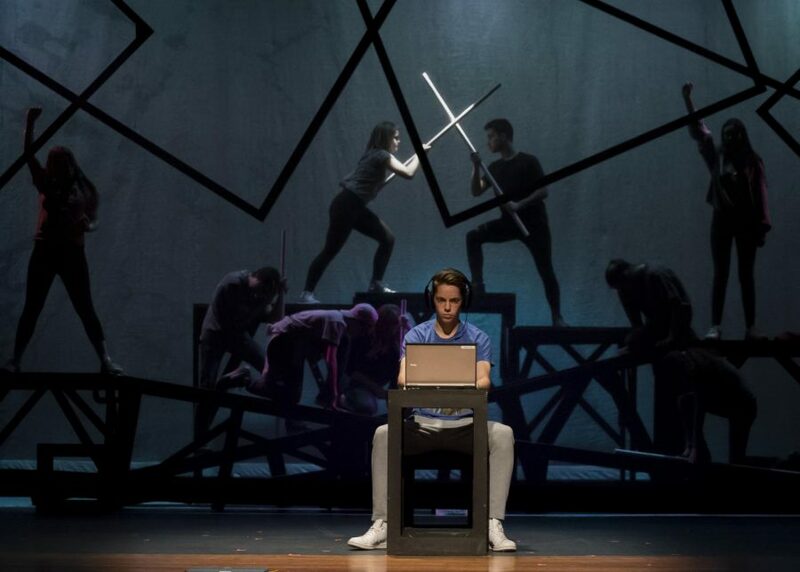 The image above (borrowed from student Heather Lee’s article in Wildcat Tracks, Weston’s student newspaper) shows our “hero” deeply engrossed in a gaming competition, immersed in a virtual world that is presented as going on behind him, skillfully lighted to suggest its semi-reality. I am committed to avoiding spoilers, so let’s just say that what happens next is unexpected but convincing. Along with the themes of technology addiction, gaming, and virtual reality, this short play also addresses a wide variety of angsty teen concerns, such as parenting, conflicts between parents, social interactions, interactions among siblings, awkward encounters, and so forth. There’s a wonderfully convincing scene of a meeting between a guidance counselor and parents, along with finely nuanced portrayals of people of different ages. Go see this play! Info about dates, times, and tickets can be found in Heather’s article (link in previous paragraph). One more comment: although I’ve never been part of the online gaming world, or its real-life counterparts such as cosplay and D&D, I know a lot of people who are involved in one or more of these. Stay tuned for a few more posts about books that present such activities more or less realistically. Player by Proxy is in the “more” category. Well done!